Privatization will cost all of us. Most agreements give companies unchecked power to keep raising rates as long as they own the assets. Here’s the core of Trump’s privatization plan: First, the federal government would offer tax credits to private firms like investment banks, private-equity investors, and private electric and water companies. Then those firms would use the credits to raise the rest of the money they need to fund the upkeep of roads or the creation of new bridges. Trump’s advisers have promised that this approach would involve as little taxpayer money as possible. But for a private firm to have any interest in a project, it will need some way to turn a profit once the project is completed. That comes in the form of higher charges or fees on the Americans who use infrastructure. A private water system, for example, would spike its rates. These costs can be quite steep. After the city of Chicago privatized its parking meters, rates more than doubled in the city’s downtown. Tolls for a privatized road in Indiana also more than doubled. Water rates for a New Jersey town’s privatized system have climbed almost 28 percent. Many agreements give companies unchecked power to keep raising rates as long as they own the assets. Trump’s air-traffic-control proposal serves as an example of how privatization is designed to foist costs onto customers. Right now, Americans’ tax dollars subsidize air-traffic control and the government controls costs. But Trump proposes to spin the agency off into a privately held company. The new company would set rates—which would no longer be subsidized or controlled by the federal government—passing those costs on to airlines in the form of air-space-usage fees. Airlines will likely tack those increases onto your flight cost, something they can get away with thanks to their monopolistic control over the market. One major airline, Delta, actually opposes privatization. The company produced a study showing that costs for air travelers would increase 20 to 29 percent, basing those numbers on the costs in Canada and the United Kingdom, where prices rose 59 and 30 percent, respectively, after privatization. Privatization, with its reliance on fees as a source of profit, also means that Trump’s infrastructure plan would ignore important projects. Those in remote or low-income areas, where there aren’t enough people to squeeze money from, won’t attract private investors. But there is still social and economic utility in maintaining rural roads or replacing the water pipes in places like Flint, Michigan. Other projects, like building better school facilities, levees, or railroad tracks, just don’t come with a source of short-term profit. Meanwhile, Trump’s budget cuts $206 billion from federal programs that directly fund infrastructure projects. This includes a $20 billion reduction in the Highway Trust Fund, the biggest source of federal money for transportation, as well as the complete elimination of the TIGER grant program for roads, rail, and transit. Trump correctly identified that our shared roads, waterways, and transit lines are breaking down after decades of neglect. But giving our assets away to the highest bidder will only increase the damage. Correction: An earlier version of this article inaccurately described the percentage increase in airfare costs in Canada and the UK post-privatization. 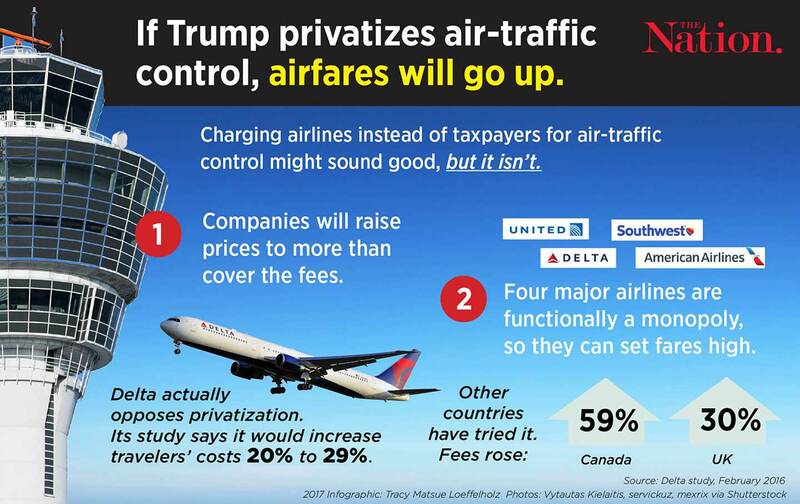 Though fares did increase, it was the air traffic control fees (a portion of the ticket price) that increased 59% and 30%, not the overall fares. The text has been updated.